AHTI Games is an online casino by SkillOnNet, launched in May 2018, licensed and regulated by Malta Gaming Authority (MGA) and the United Kingdom Gambling Commission. The AHTI Games Casino has an ancient theme of the Finnish mythology warrior. Though the website is marketed towards Finnish punters, it can be accessed by players from other countries too. There are more than 1200 games to be enjoyed by players, and these games are verified by independent auditors and software developers as being fair, and they are available in instant play format on mobile devices. AHTI Games has a superior selection of games with some software gurus. With a fully optimised website for mobile, punters can play on-the-go without download. The games found on this website include Card Games, Live Casinos, Slots, and Jackpot Progressives. Popular slots also found here are Vikings Go Berserk, Eye of Horus, Book of Dead, Lucky Little Gods, and Medusa, but the best-paying slots carry progressive jackpots, pooled with other casinos. In AHTI Games Casino, slots are more numerous than table games regarding the number, but every bit of it is exciting. Baccarat, Roulette, and blackjack are showcased in different aspects and can be played against real dealers. A Live Roulette, Poker tables, and Baccarat with a friendly environment, Professional dealers, and HD graphics can be expected by punters. This is not all, players can also interact with their peers and croupiers for a more exciting experience. Languages supported by this online casino include English, Swedish, Finnish, Danish, and German. AHTI Games gives several incentives to those who join their ranks. The most generous of all is the Sunken Treasure Welcome Package, which gives back 100% of your first deposit as a bonus, and up to 100 super spins. This package pays better than the regular ones, and members have more opportunities of receiving extra spins if they stick around. When signing up for the Welcome Package, there is no bonus code to redeem, but for other campaigns, promotional codes may be required. Another package is the Daily Picks, where players log into their accounts daily and are rewarded with incentives which come in different sizes and forms ranging from reloading bonus and cash prizes to extra spins with other benefits. AHTI Games Casino is a great place for punters, as you may never know what your next incentive will be. For Discounted Spin Packages, you can actually play more but pay less with the best deal on spins package. This means that you can have some spins for a reduced price. The Legendary Tournaments allow players to compete in the daily tournaments to win prizes and become a Legend. Players also have new opportunities for luck and fortunes with exciting Monthly Rewards. Players who join the VIP Club are able to accumulate points to gain different pearl status. There are a total of six precious pearl levels that can be achieved in the loyalty plan. The pearl levels include bronze, silver, gold, platinum, and once you have achieved these VIP experience, special invitations will be sent to you to join the top diamond and the red diamond pearl levels. Other significant benefits like a loyal assistant. At AHTI Games, the wagering requirements are 30× Bonus + Deposit, and the minimum deposit is €20, but bet placed on any game except scratch games and slots, do not count towards the wagering requirements. The bonus wagering requirements can be kept abreast at any time by accessing the Bonus Section of the Cashier, but have in mind that, wagering requirements may sometimes be different from one offer to the next. In this case, to avoid getting confused, you can go through the AHTI Games Bonus Policy on their website. Depositing at AHTI Games casino is very easy, and diverse selection of trusted and secure banking solutions are available for a player to choose from. All major payments are accepted including Skrill, Debit/Credit cards, Neteller e-Banking, and players are given the freedom to choose any of these payment methods and currencies. You can check out the deposit method available in your country by checking on the Deposit Section of the Cashier. For every Euro deposited, you will get one super spin. Feel free to make deposits, and enjoy the generous welcome bonus. All the games at AHTI Games can be enjoyed in instant play and on mobile devices, and players are not expected to make a compromise in exchange for the enjoyment of these games. It is also compatible with iOS and Android devices to make deposits possible, and to contact customer support. With this mobile device compatibility, you can get into the games anytime, anywhere, and play all of your favourite mobile casino games with ease and convenience from any mobile device. Players are expected to confirm their account when making the first withdrawal. This is a standard verification attached to only the first withdrawal request. The processing fee is also applicable to some selected payment’s solution, which will be displayed during the withdrawal process. AHTI Games provide a safe and responsible gaming environment for its players to set limits for deposits and play, to limit account access. Players can also opt-in for a reality check to enable them to stay in control of their games. All AHTI players are given the option of restricting their deposit amounts and stay in control of their budgets, by limiting how much can be deposited daily, weekly, and monthly with AHTI Game tools. Simply go to “Personal Settings” and access the Deposit Limits section. You will be able to set limits there, and this will make it easy for you to play responsibly. To know the time it will take before receiving your withdrawals, or when you receive your funds, check out the complete timetable in the withdrawal section of the Cashier. Feel free to make a deposit at any time to receive the mouth-watery welcome bonus. Once this is done, you will be ready to embark on your thrilling sea quest for fun and rewards. After this registration process, a welcome email will be sent to the email address you registered your account with, and you only need to click on the link in that email to verify your account. 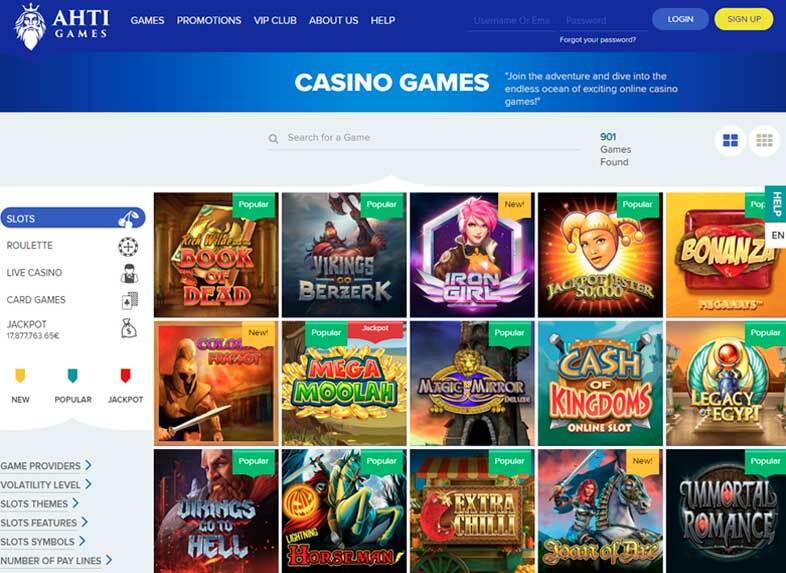 It is important to verify your account because, you will be granted full access to the gaming world, and be kept informed of all new and amazing benefits with the latest information about AHTI Games Casino. We know you are eager to receive some no deposit free spins from AHTI games casino. Unfortunately, there is no such offer at the present moment. Its first deposit offer is too good. But you can find some free spins no deposit casinos on our special page. Grab them and use now! AHTI Games Casino provides assistance in several languages through email and live chat, and it also has a well-informative FAQ section that you can go through to find out answers to most of your questions. You can also find out more about the RNG software they use, their issued license by the MGA, and some other independent auditors. Every information exchanged on the platform either through chat, email, or others, is protected using industry standard 128-bit SSL (Secure Socket Layer) encryption protocols. This ensures that all data are securely stored and kept confidential. Games permitted on AHTI Casino are from the best and most trusted providers. They include Microgaming, Yggdrasil Gaming, GVG, NetEnt, Evolution, Blue Print, Big Time Gaming, Play’N Go, and other respectable software developers. The games are verified twice, first by software developers, then by independent auditors. Although AHTI Games is a new online casino, it has already set meaningful milestones, because of its attractive features meant to close the gap separating it from leading operators. The list of most trusted and respectable software developers, the unique theme and design, exciting games with a progressive jackpot, free super spins, makes it easy for the recommendation.